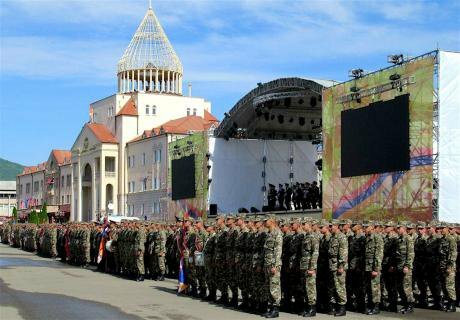 Soldiers of the Nagorno-Karabakh Defence Army on the central square in Stepanakert, capital of the self-declared republic, May 2017. Photo CC BY 2.0: David Stanley / Flickr. Some rights reserved. This article originally appeared at Open Caucasus Media. We are grateful for their permission to republish it here. For three decades the border between Nagorno-Karabakh and Azerbaijan has echoed with the crack of gunfire: the ceaseless noise of the oldest ‘frozen conflict’ in the former USSR. Yet for those living in Nagorno-Karabakh since the ceasefire of 1994 was signed, this border has seemed to drift further and further away, almost vanishing from the horizon of relevance. This opinion was far from unique, and was echoed by many in Karabakh. One respondent, a young man in his mid-twenties, said that the events of April “opened his eyes” to the “real danger” that Azerbaijan presented. For him and for other young people, the ceasefire had been all they had ever known, and for all the bellicose rhetoric and the slow but constant deaths on the border, it had become background noise, as fixed and permanent as the hills and sky. Since the clashes of April 2016 — four days during which fierce fighting erupted along the line of contact, and ended with over a hundred fatalities, and the seizure by Azerbaijan of several key positions formerly controlled by Armenian forces — the conflict has taken on a shrill immediacy. The shock which initially gripped the population of Karabakh transformed into anger both at Azerbaijan and at the loss of a sense of normality. A few years ago, flare-ups in the prolonged conflict might have been seen both by residents and politicians as exceptional, but this most recent violent eruption seems to have solidified in their minds a sense that rather than an exception, war is in fact, the normal state of affairs, and that military interests must circumscribe and submerge all other pursuits. The Karabakh war lasted from 1988–1994. It claimed over 30,000 lives, displaced almost a million people, and utterly devastated Karabakh’s economy and infrastructure. The region suffered an estimated $5 billion in damage (with a population of only 140,000) — further compounded by the deindustrialisation that followed the USSR’s collapse. Nevertheless, Nagorno-Karabakh endured. With generous aid from the Republic of Armenia as well as donations from the global Armenian diaspora, Nagorno-Karabakh was rebuilt. By 2007 it had the fastest growing economy in the wider region, with GDP growth rates fluctuating between 10%–15% per year. Moreover, unlike Armenia, it did not suffer from demographic decline, with the population increasing by 10% since 2005. This quite literal “rise from the ashes” is most apparent in Karabakh’s capital, Stepanakert. Formerly a bombed-out city with more than a passing resemblance to post-war Sarajevo, it has in recent years developed into a small yet bustling urban centre, featuring well-paved boulevards, neatly maintained gardens, and a wealth of public amenities. ‘At first [Karabakh’s economic development] was a patriotic undertaking’, Davit Babayan, speaker for the office of the President of Nagorno-Karabakh, told OC Media. ‘But that cannot work forever’. He argues that Karabakh’s economic motor for the past decade was a commitment to a ‘market-driven’ economy, and that only by creating ‘special conditions for investment’ would Karabakh’s development continue. Officially, Nagorno-Karabakh has been on an explicitly market-oriented path since 2007, when under the official direction of its newly elected President Bako Sahayan, it undertook rapid (neo)liberal economic reforms. Examples of this include: the dissolution of the anti-monopoly service (under the slogan “The Market Will Figure It Out”), the creation of a flat-tax for those categorised as self-employed ($15 a month), and the reduction of regulations on construction licenses (officially it should take only three days for a new license to be approved). The reforms also entailed the privatisation of a series of state-owned assets, most significantly, the regional hydropower utility. 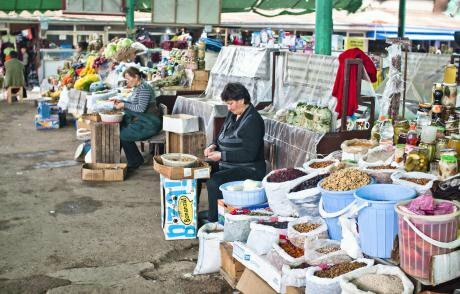 Considered in conjunction with Karabakh’s stellar rates of economic growth, these reforms drew praise from liberal voices in the wider region, with some even calling the region “The Caucasian Tiger”. However, in a similar vein to the “Asian Tigers”, Karabakh is less of a market miracle than is apparent at first glance. Karabakh’s rapid development has been made possible only through significant government intervention in the market and perhaps more importantly, ongoing transfers of funds from the Republic of Armenia. This state of affairs is only made possible through Karabakh’s unique geopolitical and ideological position. Nagorno-Karabakh is without question the single most volatile factor in Armenia’s politics. It is not simply a place, but an idea. It stands in for Armenian nationhood, and in a country where the Armenian Genocide of 1915 still defines foreign policy, it provides a powerful counter-narrative to a sense of historical victimhood. As Karabakh politician Karen Avagimyan told OC Media, Karabakh is “the spiritual heart of Armenia”. 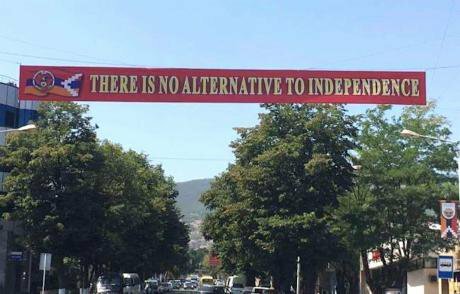 A banner in central Stepanakert. Photo (c): Khachig Joukhajian / OC Media. All rights reserved.In practical terms this means that if any significant amount of territory in Karabakh is re-taken by Azerbaijan, the government in Yerevan would likely not survive. For instance, in the summer of 2016 a group of Karabakh veterans calling themselves the Sasna Tsrer (the Daredevils of Sasun) seized a police station and called for an uprising against the government. Central to their criticisms of the government was their claim that the current administration intended to cede part of Karabakh to Azerbaijan. While the claim seems to have been spurious, at the time, it helped to mobilise thousands of young people who met with police in violent clashes in defence of the Sasna Tsrer. The policies of the Armenian Government towards Karabakh, and the policies of the Karabakh government itself, must be understood in the light of such events. Karabakh’s territorial integrity must be maintained, and all economic and social policies must account for and support this objective. As Nagorno-Karabakh is an unrecognised state, it is therefore not party to most international trade-treaties. This means the government needs to maintain an investment friendly atmosphere and to advertise this friendliness, if “non-patriotic” investment (coming primarily from the Russian Federation) is to continue. However, this creates a certain conundrum for the ruling authorities. Investor-friendly and deregulated markets often foster grave societal inequality, with less competitive local workers and small businesses being crushed by economies of scale. As in much of the world, poverty easily transforms into migration, which while quite tolerable for most governments, in Karabakh is simply a non-starter. In the eyes of Karabakh officials, the equation of migration is simple: migration equals a lower population, a lower population means fewer soldiers, and fewer soldiers not only makes Karabakh militarily weaker but also incentivises Azerbaijan to attack. This means that the economy cannot be subject to the whims of a capricious market, as population fluctuation resulting from periodic economic crises would quite literally endanger Nagorno-Karabakh — neoliberalism tout court is not a tenable option. In practice, the collection of policies enacted to ensure economic stability and liveability in Nagorno-Karabakh can be considered a sort of militarised social democracy: welfare mechanisms are in place to lessen the impact of unemployment or poverty, but they differ from traditional European social democracy in that these mechanisms are tied explicitly to military status. For instance, a large portion of the population sits on military pensions, and the families of soldiers killed or wounded on the front are not only financially supported, but often granted free housing or other essentials and amenities. The state also insures all residents who live close to the line of contact, with any damage from the conflict (such as homes damaged by shelling or cattle killed by gunfire) covered by the state. Market in Stepanakert, 2012. Photo CC BY-NC-ND 2.0: Marco Fieber / Flickr. Some rights reserved.That’s not to say the government doesn’t make use of traditional Keynesian policy either. In fact, the state often intervenes at the level of the firm, providing subsidies and preferential loans to struggling businesses, keeping them afloat to ensure that a higher level of employment is maintained. It may seem like this is a little much for a government presiding over a relatively poor population of 146,000 to accomplish, and that’s because it is. The government of Nagorno-Karabakh is far from self-sufficient. Officially, at least 4.5% of Armenia’s national budget is allocated for the region, though the real number is likely far higher, especially since any budget transfers related to national defence are classified. This policy direction has only solidified since the April clashes. Villages near the line of contact have become subject to new legislative classification as “border villages”. Here, according to Speaker of the Prime Minister’s Office Artak Beglaryan, the government’s explicit purpose is to maintain, and if possible, increase the population in order to create a presence that would detect and deter Azerbaijani attacks. This is a difficult task, as these villages are directly in the line of fire — an understandable disincentive for citizens to continue living there. Which is why under the auspices of this new legislation the government has increased subsidies for these villages — for instance, creating a gas and electricity subsidy that, for some households, entirely covers their monthly bills — as well as providing financial incentives (again subsidies, as well as tax breaks) for investment in border villages in order to stimulate employment. But the lengths to which the government is willing to leave behind neoliberal economic orthodoxy is most apparent in the village most affected by the conflict: Talish. In the dawn hours of 2 April 2016, the north-western heights above the small village of 500 were overrun by the Azerbaijani military. By the time Armenian forces retook Talish, it had been reduced to rubble, and even after the ceasefire was signed, the strategic hills overlooking the village remained in Azerbaijani hands. With most of the homes destroyed, the people of Talish have become homeless, living with relatives or in state-provided housing in nearby villages further away from the line of contact. However, even in its current strategically vulnerable position, the Karabakh government is committed to rebuilding Talish, and having its residents return. 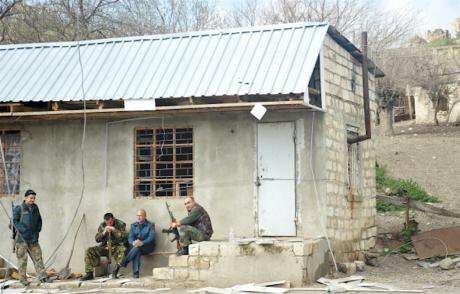 Armenian militia in Talish, a village in the Martakert region of the self-declared Republic of Nagorno-Karabakh, April 2016. Photo (c): RIA Novosti. All rights reserved.Every single family that lost a home will have their home rebuilt. Infrastructure will be repaired and updated. New buildings will also be added, including a house of culture and a recreation centre. But these are not the most ambitious plans for the village; in order to ensure a high level of employment and a strong degree of social solidarity, the village is rebuilding its agricultural and production capacities in a collective model. In the words of Talish Mayor Vilen Petrosyan, “It will be like a Soviet kolkhoz (collective farm - ed. ), but different. Instead of giving our profits to the government, the community will decide what to do with them”. The beginnings of this new/old model are already in place. The Talish ‘collective’ is producing honey, fruit and vegetables, spirits, meat, and dairy — with several dozen workers employed by the social enterprise composed of former Talish residents (entirely men) who have returned to the village as government contractors, working to rebuild their homes and defend them in case of an attack. Whether the model will work, and if it will actually be democratic, remains to be seen. But for the local administration, the hope is that the new Talish will not only flourish, but become a model of economy and governance for other villages in Nagorno-Karabakh. From 1994 onwards, the people living in Nagorno-Karabakh have been holding out hope for a peaceful normalisation of their situation. But as repeated peace deals floundered, and a deep chill descended, many began to adapt to a new status quo. Even if peace never came, life would go on. But the events of April 2016 shattered this uneasy sense of stability. In a strange irony however, as the Karabakh people’s sense of stability was shattered, the existing economic and political order only grew stronger. As a region forged in the crucible of conflict and still enduring its ravages almost thirty years later, Nagorno-Karabakh has ceased being a place where the military exists to support state and society. Rather state and society now exist to support the military. And that is unlikely to change any time soon.